The arrival of a Dell laptop sporting an AMD logo is something that has long been muted, but was never actually expected to happen, the relationship between Dell and Intel being that strong. However, the increasing need for budget machines, as well as the improved performance of AMD chips, has forced the IT giant to reconsider its position. The Dell Inspiron 1501 follows the current Dell colour scheme of silver with white trim for a look that is quite utilitarian. Sporting the AMD Turion 64 X2 Mobile TL-50 processor, this is a mid-range dual-core offering that supports 64-bit, so there is plenty of future-proofing to be had. However, this wasn't reflected by benchmark scores, largely due to MobileMark 2005 not being optimised for Turion chips. 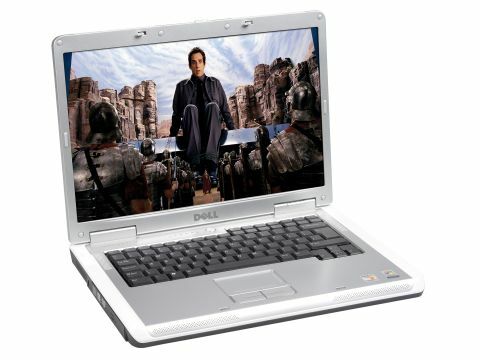 Fitted with 1024MB of DDR2 memory, this is a fast and efficient laptop. If your budget is tight, you can opt for a slower Turion processor, which is the singe core version of the chip sent to us for review. It comes with 512MB of memory and 60GB hard drive. As it shares the same chassis as this slightly more expensive version, you don't lose out on build quality. Made from thick plastic, the body is strong and resilient, with plenty of protection behind the screen. Weighing 3kg, this isn't an ultraportable laptop, but Dell ships it with two battery packs, each running for 236 minutes and 364 minutes respectively, so in theory you can take advantage of all-day mobile computing. The chassis needs to be heavy to hold the 15.4inch Super-TFT panel. Graphics are integrated, so you won't want to use it for anything more than simple editing tasks, but the screen is bright. The keyboard is pushed quite far back on the main board, which means you need to stretch a little to reach some of the keys and, while it's not the sturdiest keyboard on the market, it proved reliable for the price. The touchpad mirrors the widescreen aspect ratio of the panel and was accurate, but the mouse buttons, while large, felt a little loose in their mountings. Overall, the build of this machine is above average for its price, but there are small areas of concern. You won't find too many extras. Wi-Fi supports 802.11g, but the Ethernet is 10/100 Base-T. The DVD rewriter supports dual-formats, but not dual-layer. The Dell Inspiron 1501 represents good value for money. It isn't the most powerful machine, but the extended battery life and the build quality makes it an appealing choice, especially if you opt for the lower- priced specification.